Alcoholic Beverages: Any type of alcohol can be poisonous to your pet and aside from intoxication, can cause a coma or even death. Apple Seeds: Can have varied effects on pets. Apricot Pits: Can cause respiratory difficulties such as breathing, coughing and sneezing. Cherry Pits: Can cause respiratory difficulties such as breathing, coughing and sneezing. Candy containing the sweetener Xylitol: Can cause liver damage and even death. Chocolate: Although pets should never have any type of chocolate, milk chocolate is not nearly as dangerous for animals as semi-sweet or unsweetened bakers chocolate. Chocolate poisoning can cause irregular heart rate and rhythm, restlessness, hyperactivity, diarrhea, vomiting, panting, muscle tremors, abdominal pain, bloody urine, increased body temperature, seizures, coma and possibly even death. Coffee: Can result in increased breathing and heart rate, restlessness and affects the central nervous system. lethargy, abdominal pain, lack of appetite and kidney damage. Hops: May cause panting, elevated temperature, increased heart rate, seizures and possibly death. Macadamia Nuts: Can cause vomiting, lethargy, hyperthermia, abdominal pain, stiff joints, lameness and tremors. Moldy Foods: Can have varied effects on pets including vomiting and diarrhea. Mushrooms: Different types of mushrooms can have varied effects on pets such as, depression, diarrhea, nausea and vomiting, abdominal pain, tearing, hallucinations, defecation, liver failure, seizures, drooling, urination, kidney failure, heart damage, hyperactivity and in some cases, death. Mustard Seeds: Can have varied effects on pets. Onions and Onion Powder: Can cause gastrointestinal problems such as vomiting and diarrhea. Peach Pits: Can cause respiratory difficulties such as breathing, coughing and sneezing. Potato Leaves and Stems: Can cause problems with the digestive, nervous and urinary systems. Raisins: Large amounts of raisins can be poisonous to pets and can cause vomiting, diarrhea, lethargy, abdominal pain, lack of appetite and kidney damage. Rhubarb Leaves: Can cause problems with the digestive, nervous and urinary systems. Salt: In large quantities can cause electrolyte imbalances. Tea: Can have varied effects in pets. Tomato Leaves and Stems: Can cause problems with the digestive, nervous and urinary systems. Walnuts: Can cause gastrointestinal problems such as vomiting and diarrhea, as well as respiratory issues such as sneezing, breathing and coughing. Yeast Dough: Can be dangerous as it will expand and result in gas, pain and possible rupture of the stomach or intestines. Christmas is a special time of the year for you and your family. Following safety tips will help to keep the holiday season joyful. Have a safe and happy holiday! Consider an artificial tree as they are much safer and cleaner. Cut one inch off the trunk to help absorb water. The tree stand should hold a minimum of one gallon of water. Make sure the tree is secured and cannot be knocked over. Keep the tree away from all heat sources. Use miniature lights that have cool-burning bulbs. Always turn off the tree lights when going to bed or leaving the house. Never use candles even on artificial trees. Dispose of the tree properly after the holidays. Make sure you have a properly working fire alarm. Use only outdoor lights on the exterior of the home. Never use worn out light strings. Connect no more than three strands of lights together. Never use an indoor extension cord outdoors. Avoid overloading wall outlets and extension cords. Keep outdoor electrical connectors above ground and out of the snow. Extinguish fireplace ashes before going to bed or leaving the house. After parties, check under and around chairs, sofas and other furniture for smoldering cigarettes if there have been people smoking in the house. Have at least one working carbon monoxide detector in the house. Have a fire extinguisher available. Here’s a local news item that everyone should be aware of in case a similar situation may threaten the water supply where you live. This could be a real cause for concern no matter where you live. Here's something that just popped into my head.... It's second nature to me because I've done quite a bit of off-roading. When the time comes to bug out, and I suspect it might be pretty soon, it may become necessary to go off-road, due to stalled traffic, road blocks, etc.... Joe of Viking Preparedness had an excellent post on convoys yesterday, and I felt that I could add to it with some off-road driving rules/tips. Never traverse a hill. Always take the hill straight on, or at a less than 45 degree angle. Let your "pucker factor" be your guide! If it doesn't feel right, it ain't. Be even more conservative if you are in an SUV, and especially conservative in a lifted vehicle. Never "charge" a hill blind! If you don't know what's on the other side, you might be in for an unpleasant surprise! I know this from experience, brakes don't work when you're airborne, and you've just seen the pond on the other side..... Heh heh heh. If in doubt, scout it out! Never assume you'll make it through that mud "puddle". Again, I've had the experience of a mud "puddle" suddenly becoming a sink hole. 2 trucks, 2 winches, and 2 hours later I was free again...... If in doubt, scout it out! (There's a theme developing here.....) Probe the mud hole with a stick or something to see if it is passable. Another thing to try if the emergency brake trick doesn't work is to slip a rock, piece of wood, or whatever else you can find under the tire that is spinning. This will give it more traction, and get you out of the hole. If you even think you might be forced off-road, a come-along, tow strap(s), a length of chain, and some shackles are a sound investment. All can be gotten at Harbor Freight for 50 bucks or less. An electric winch is the ultimate "unstucker", but they ain't cheap! Like power lines, Texas is blessed with a lot of pipeline right-of-ways, which are also kept clear of brush, trees, and major obstructions. They are usually kept mowed down as well, and could become handy "stealth highways" if the need be. Watch out for pipeline markers, they are usually T posts, driven in deep, and they can cause some damage to your vehicle. Some markers are welded pipe, and those should really be avoided! Here it comes again, if in doubt, scout it out! There are also oilfield roads (but be aware that most of 'em dead end at a drilling rig or well! ), park roads, ranch roads, and many other alternatives to the highway in an emergency situation. There are many, many maps available on the Texas General Land Office website, as well as from the US Geological Survey. These maps cover so much more than Rand McNally! Ranch roads, logging roads, oilfield roads, all the little county roads...... Very handy. I guess the last thing is to consider the weather. If it's been rainin' cats and dogs, even if it's been a few weeks since the last rain, you might want to avoid off-roading if at all possible. At the very least, be extremely cautious. Snow (not that we get much down here!) can hide obstructions, holes, etc., so be especially careful in it. Ice, which is a possibility, can make things extremely treacherous. Never attempt a river or creek crossing before checking things out thoroughly first! Even a few inches of moving water is enough to sweep your vehicle downstream....... One more time! If in doubt, scout it out! Now for the disclaimer (ugh): In no way do I advocate violating private property rights, any laws, rules, or regs, or anything like that. This is meant for informational purposes only, and in no way should be considered an endorsement of any possible illegal activity. So there! Be aware. Be informed. Be prepared! RW recently did a fine piece on Stealth Survival about house boat living. This morning, responding to a comment I'd left on another post, he asked me when I was gonna do one on house boats.... So here it is, boat living ala Mayberry. First off, a little background: My name is Mayberry, and I'm a boataholic. Not to make light of 12 steppers out there, but I've been a boat nut from childhood. I cut my teeth on Grandpa's 18 footer, driving it since I could see over the console (he actually figured out one day that I couldn't see over the console, propped me up on his knee, and I skippered just fine after that...). My Dad has owned many boats, and I logged way more hours at the helm of his boats than he did! I also helped with care and maintenance. I've worked on, operated, built, and rigged everything from a 10' aluminum boat to a 76' twin diesel offshore rig. 90% of my "library" is boat related. Repair, design, construction, and rigging. I've got years of study under my belt. My resume includes two boat dealerships, a yacht repair yard, a boat builder, my own boat building/repair business, and my current gig with TPWD. Soooooo on with the boats! Now, a few boat living myths...... Boats are damp. Well, they can be, but most of this comes from the days of old when men were men, and boats were wood. All boats leak a little, wood boats leak a lot. Wood boats require the wood to be wet and swelled up to seal tightly. This works fine below the waterline, but topsides dry out, seams open up, and you get leaks. This keeps the bilges damp, and therefore your interior. 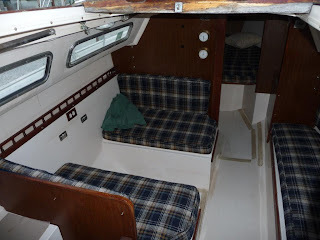 Air conditioning alleviates most of the dampness problems in modern boats, as does fiberglass construction, which makes the interior very comfortable. It's not required though. Well ventilated boats stay very comfortable inside, due to the cooler air temperatures typically found on the water, and the breezes the water generates. Granted, humidity is higher on the water, and things can and will get damp at times, but that can happen anywhere. Myth number two: Boats have no storage. Horse puckey. My 26 foot Chris Craft had storage galore. Storage under the berths (beds). A hanging locker. Storage under the dinette seats. Storage in the galley (kitchen) drawers. Storage in the head (bathroom). Storage in the "eyebrow", or the forward part of the flybridge, the upper helm (steering) station, and on the sides of the bridge coaming as well. Storage in the lazarette, or the compartment beneath the cockpit sole (deck). Storage everywhere! On top of that, she could sleep 4 comfortably, had a fridge, stove, sink, air conditioning, and a full head with shower. When I (sadly) pulled that boat out of the water for the last time, it took me 2 hours to unload all the junk that was stashed aboard..... Storage abounds on most boats. Some are better than others, of course, but with a little bit of ingenuity, one can pack a lot of gear aboard, and not have a lot of clutter. Myth number three: Boat living is expensive. Hogwash! Of course, if you buy a multi million dollar yacht and dock it at the Ritz Marina it will cost a (not so) small fortune, but their are some very reasonable alternatives. 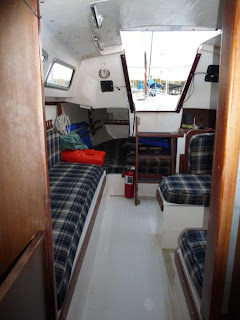 For instance, a quick search on Boattrader.com turned up this little gem, for an asking price of $18,995 (which means it could be yours for $15,000 or less...). O.k., now that we've dispelled some of the myths, lets get into the meat. A liveaboard boat is going to be a very personal choice, but there are a few generalities to take into consideration to help narrow your choices. Hands down, the most "bang for the buck" comes from houseboats. They give the most interior volume per dollar of most power boats, and even most sailboats. Power boats and sailboats each have their advantages and disadvantages as far as living aboard goes... Powerboats generally have a wide beam, or width, that translates into more interior volume. But (there's always a but, ain't there?) some of that space is eaten up by engines and big fuel tanks. Most sailboats don't have big engines or fuel tanks, but their trimmer, rounder hulls reduce interior volume compared to most powerboats of the same length. 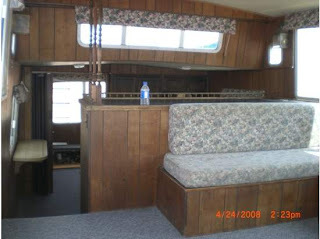 Most larger boats' systems are very similar to RV systems. Propane or electric cooking (some boats have alcohol stoves, which are nearly worthless for cooking, and dangerous in my opinion, due to the nearly invisible flame...), independent 12 volt DC and 120 AC (shore power, and/or onboard generator(s)) electrical systems (some larger vessels have 24 volt, and even 36 volt DC systems for cranking over large diesel engines), holding tanks for waste, water tanks, and their associated pumps.... These systems can be as simple or as complex as you imagination (and wallet) can handle, from a Wal Mart battery, 2 wires, and a light bulb, to multiplex systems with microprocessor control and data busses. The options are nearly endless, though I would opt for the simple systems myself, especially considering a SHTF scenario and possible loss of infrastructure to maintain all that jazzy stuff. 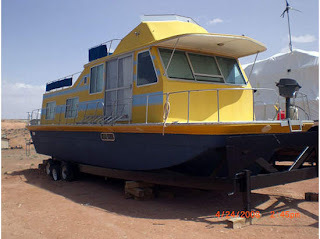 Now for some fun stuff: Modifications, and "home brew houseboats"! 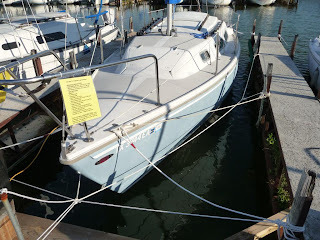 Say you found yourself a nice older powerboat for a liveaboard. You're never gonna leave the dock, it's just your floating home. Best to buy a nicer hull with some clapped out engines. Yank those engines out, fuel tanks too, and convert the space into a nice "basement" to store your preps in. Install water storage tanks in place of those fuel tanks. Or maybe build in more bunk space. Your imagination is the limit! You could build yourself a "floater" as we call 'em down here, a floating cabin. 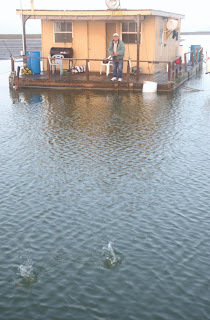 A home built houseboat. If all you're looking for is a floating home, propulsion isn't really that big a deal. You'd be surprised what you can tow (very slowly) with a 12 foot dink and a 15 horse outboard. With the promise of a day on the water (some gas money, and a case of beer....), most folks are more than willing to lend a hand (and a boat) if and when you need to move your houseboat. Large lakes abound here in Texas, so there should be plenty of places to set up shop, and the coast presents many opportunities for waterborne living as well. Keep in mind that all major lakes in Texas, except Caddo, are man made, and therefore dependent on a dam for their existence. If the dam breaks....... Well, you'd be in for a wild ride, at least. And don't be a pain in the boat! Ha ha. Never, ever dump waste, trash, etc. in the water. If you do drive your house around, mind your wake. You are responsible for damage caused by your wake! Learn and abide by the "rules of the road". Respect fellow boaters, swimmers, fishermen...... And learn the meaning of water tight integrity! Otherwise, you just might get that "sinking feeling". Heh heh. Happy boating!